Precaution: Do not use unless solution is clear. • Identify Blood-Pack unit using appropriate donor identification system. Confirm that all numbered tubing of each Blood-Pack unit contains its own identical segment numbers. • Adjust donor scale to desired collection weight. • Position primary container from donor scale as far as possible below donor arm and clamp donor tubing with hemostat. • Apply pressure to donorâ€™s arm and disinfect site of venipuncture. • If blood pressure cuff is used, inflate to approximately 60 mmHg. • Holding the hub and cover near the tamper-evident seal, twist cover 1/4 turn to break seal. • Remove needle cover, being careful not to drag the cover across the needle point. • Perform venipuncture, appropriately secure donor needle and/or tubing and release hemostat. • Mix blood and anticoagulant at several intervals during collection and immediately after collection. • Collect the appropriate volume based on Blood-Pack unit used. Note: The volume of anticoagulant is sufficient for the blood collection indicated on Blood-Pack unit ± 10%. • Apply hemostat to donor tube. • As appropriate, release pressure on the donorâ€™s arm, collect donor samples following established procedures and withdraw donor needle. Precaution: Use care to avoid accidental needle sticks. One of the Fenwal Needle Protector Systems may be used to reduce the risk of needle stick injury.Strip blood from donor tubing into container, mix and allow the tubing to refill; repeat once. Seal at X marks on donor tubing to provide numbered aliquots of anticoagulated blood for typing or crossmatching. • Strip blood from donor tubing into container, mix and allow the tubing to refill; repeat once. Seal at X marks on donor tubing to provide numbered aliquots of anticoagulated blood for typing or crossmatching. • Discard needle into an appropriate biohazardous waste container following established procedures. • Store filled unit between 1 and 6° C.
• Infuse blood within 21 days of collection. Store at Controlled Room Temperature. United States Pharmacopeia, General Notices. United States Phramacopeial Convention, Inc.
Fenwal and Blood-Pack are trademarks of Fenwal,Inc. © 2009 Fenwal, Inc. All rights reserved. Each unit consists of a PL 146 Plastic primary container with 67.5 mL of ACD solution containing 1.65 g Dextrose (monohydrate) USP, 1.48 g Sodium Citrate (dihydrate) USP and 493 mg Citric Acid (anhydrous) USP. Store at Controlled Room Temperature (refer to direction insert). • Open pouch by tearing across at notch. • Direct handling of product surfaces prior to extended storage in the foil pouch, may result in mold growth. ll) Unused units removed from foil pouch are returned to the foil pouch within 12 hours. Units may be removed from the pouch and returned only once. 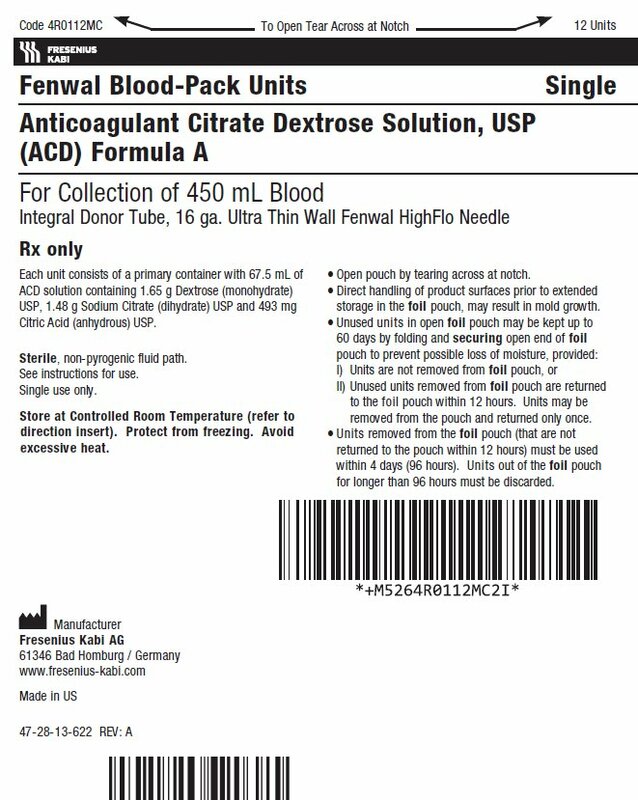 FENWAL and BLOOD-PACK are trademarks of Fenwal, Inc.